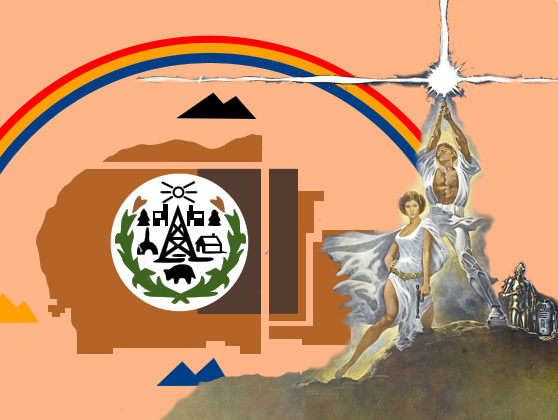 Exemplifying how Star Wars is truly a universally beloved saga, this July is seeing the release of Star Wars Episode IV: A New Hope dubbed in the language of the Navajo nation of Native Americans. The Navajo Nation Museum has been collaborating with Lucasfilm to translate the first Star Wars movie into Diné bizaad: a language currently spoken by nearly a quarter-million people, most of whom live throughout the American southwest. And if you speak fluent Navajo you'll have a chance to get in on the action because auditions are slated to start later this week at the museum in Window Rock, Arizona. For now everything about the Navajo script is being held close to vest (even the title, which TIME.com speculates could be Sǫʼ Baaʼ). The classic phrase "May the Force be with you" could translate into "May you walk with great Power", or many other possible permutations. It's much the same issue that was confronted by the Navajo code talkers who served in the American armed forces during World War II: there were no direct Navajo words for guns, bombs etc. so those became "tapes" and "eggs". Australia became "Rolled Hat" after that country's signature headwear, and America was called "Our Mother". So... how is terminology like "lightsaber", "hyperdrive" and "Grand Moff" going to work out in Diné bizaad? Apparently the staff at the Navajo Nation Museum and the crew at Lucasfilm have figured it all out. Very big thanks to Tilly Godbudak for finding this great story!